Shun, pronounced “shoon”, is a Japanese term used to describe the precise moment when food reaches the peak of perfection. It’s only fitting, then, that one of the most respected brands of Japanese culinary knives takes its name from that pivotal moment when food is the freshest and most delicious. The Sora line from Shun is more affordable than its Classic line, and worth considering if you’re looking to invest in high quality Japanese knives. We’re going to be taking a closer look at two of our favorite knives from the Sora collection, but first, let’s discuss some of the reasons why you should buy these knives in the first place. 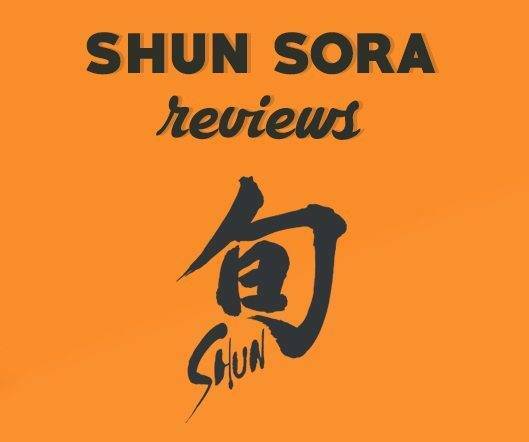 Why Should You Choose A Shun Sora Knife? Known for its superior craftsmanship, the Seki City-based Shun has been in business for more than 100 years. Experience is one thing, but craftsmanship is a different ballgame – and one that Shun plays well. All of the knives in the Sora line are handcrafted by skilled artisans. It takes 100 steps to make just one of these knives. Sora knives are a more affordable option that other knife collections in the Shun line-up. VG10. The blades feature a VG10 (high carbon) cutting core that’s surrounded by high quality stainless steel. The san mai edge allows for superior stain resistance. San mai is a traditional samurai sword-making technique under which a hard steel core is sandwiched between two layers of softer steel for added support. Composite blade technology combines the best qualities of two steels in a single blade. A 16 degree cutting angle ensures that the blade is exceptionally sharp, while keeping the blades thinner and lighter. Handles are constructed with a textured PP/TPE blend. Many of Shun’s knives feature wood handles, but the Sora line has a handle made with a blend of PP/TPE. That’s not to say that the handles aren’t durable (they are), but this may be a slight drawback for anyone that prefers wooden handles. Simply put, Sora knives are extra-sharp, expertly crafted and built to last. Shun offers quite a few knives in its Sora line, but the Santoku and Chef’s knives are our two favorites – and the ones we use every day in our own kitchens. They’re incredibly versatile, and make quick work of most prep tasks. The Sora Santoku 7” knife features a VG10 cutting core sandwiched between layers of durable, stain-resistant stainless steel. With a 16-degree cutting edge and a mirror-polished 420J upper, this knife is beautiful to look at and boasts an extra-thin blade for maximum cutting efficiency. Sora uses high-performance technology to create a superior cutting edge. Two laser-cut sections are fit together, and then bronze welded to permanently meld them together. The blade features an exquisite wavy pattern that resembles the same hamon lines found on Japanese swords. The hollow ground design creates small pockets of air, which help prevent the food from sticking to the blade. Food just slides right off of the blade as you cut, and the design of the blade allows you to easily scoop up and slide the food right into the pan (or wherever you want it to go). The TPE polymer handle offers excellent balance. Weighing just 6.2 ounces, this knife is very lightweight, but still feels great in your hand. The textured grips is easy and comfortable to hold while preventing unwanted slips. For those of you who don’t know, the Santoku knife, which means “tree virtues” in Japanese, is primarily used for three tasks: cutting, chopping and dicing/mincing. The Sora Santoku does all of these tasks wonderfully. 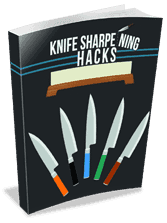 You’ll be amazed by how easy and quick prepping becomes when using this knife. The edge is incredibly sharp, and holds up exceptionally well even after extensive use. That’s primarily due to the VG10 core that provides most of the cutting power. The stainless steel layers that surround the core are designed to prevent staining, and don’t have much of an effect on the sharpness of the blade. One thing I do have to note is that, like with any other good knife, you can’t put these in the dishwasher. Shun explicitly states that these should be hand washed, and they’re absolutely right. Tossing them into the dishwasher is convenient, but will damage and dull the blade over time. The only complaint we had about this knife, and it’s a small one, is that it has a plastic handle – not a wooden one. With that said, the handle is textured, so it prevents slips, and is highly durable. Wood handles are preferred, but at this price point, it’s impractical. The blade is exceptionally sharp and holds its edge well. At the end of the day, that’s what really counts. The Shun VB0706 Chef’s Knife boasts an 8” blade with the same construction as the previous knife: VG10 cutting core and stainless steel outer layers. The san mai edge offers stain resistance, and the mirror polished blade upper adds brilliant shine. There’s a lot to love about the Sora Chef’s Knife, and it’s an excellent knife for everyday use. Like the Santoku knife, Shun’s Chef’s Knife features a san mai edge. A VG10 high carbon steel core is surrounded by layers of stainless steel that help prevent rusting and corrosion. The blade upper is made of polished 420J, and the blade features a 16-degree cutting edge. Along the top edge of the blade is that beautiful wave pattern that you find on Japanese swords. There are no hollow grounds in this blade, but you’ll find that food slips right off without a problem. The handle, like the previous knife, is made of textured plastic. The textured pattern creates a non-slip grip, so you never have to worry about the knife slipping out of your hand when you chop juicy fruits and vegetables. The Chef’s knife is one of those “must-have” knives that every home kitchen should have, and Shun offers one of the best in its class. We’ve used this knife for virtually everything from mincing garlic to slicing onions, chopping meat and dicing fruit. Food slides right off the blade, and the edge is so sharp, we had no problems cutting through juicy, “squishy” foods. Like the previous knife, and all other higher quality knives, the Shun Chef’s Knife should be washed by hand, dried immediately and put away. Careful care will help maintain the blade’s edge for longer, and prevent stains or rusting. Because the blade is not made with full VG10 steel, you will be limited by how often you can sharpen this knife. With that said, Shun’s knives hold their edge for a very long time, so this should not be a problem. By the time you reach the point where you can no longer sharpen the blade, it will probably be time for a new one. Conclusion: Is The Sora Line Good For You? Shun’s Sora line of knives is one of the best in its class. The famous Japanese knife-maker finds a way to offer about the same quality blade found on its higher-end knives, but in a more economic, budget-friendly package. If you’re serious about creating a collection of Japanese knives, the Sora line is a great place to start.